Each year qualified non-profit 501(c)(3) organizations are invited to apply. There are several ways you can contribute to Friends of Hawaii Charities! Be a friend to local charities! Make a donation to Friends Club today! Welcome to Friends of Hawaii Charities! e bring together financial resources from the private sector and spirited volunteerism from the community, with the extraordinary natural resources of the state to produce sports and cultural events that generate funds for qualifying not-for-profit endeavors that serve and benefit Hawaii’s women, children, youth and impoverished. Local Charities Win from the Sony Open in Hawaii! When you donated to a participating charity through the Aloha for Hawaii Charities during the campaign period from November 15, 2018 - January 15, 2019 (noon HT), that charity will receive 100% of your donation plus a bonus boost for a funding pool generated by Friends of Hawaii Charities from Sony Open in Hawaii proceeds. CAMPAIGN PERIOD: November 15, 2018 - January 15, 2019 (noon HT) and now it's closed. Local Charities Win from 2018 Sony Open in Hawaii! 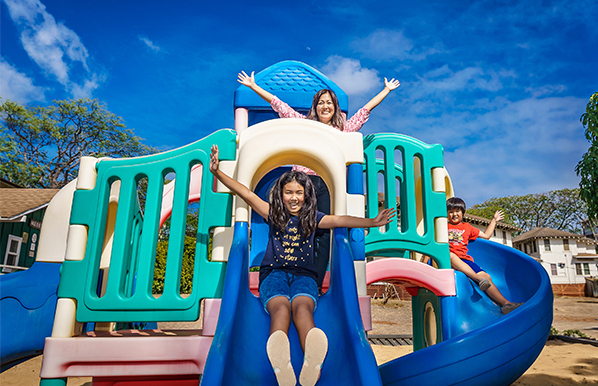 Friends of Hawaii Charities awards grants annually to qualified not-for-profit organizations, funding programs that benefit Hawaii’s children, youth, women and impoverished. A total of $1.1 million in charitable grants was distributed last year from proceeds raised at the 2018 Sony Open PGA TOUR event. The 2019 Grant Application is now closed.